In this SlOkam – ALavandhAr enjoys emperumAn‘s togetherness with periya thiruvadi (garudAzhwAn), who has the activities of being the dhvaja (flag) and everything, and who is always dear to emperumAn like a fragrant fruit. dhAsa: – All his activities will bring about glories to ISvara. sakhA – having the greatness of being a companion for emperumAn while he manages the universe [such as being his vehicle while descending to protect gajEndhrAzhwAn, the elephant]. vAhanam – one who brings ISvara to his devotees when they are in trouble, for their protection. Asanam – when emperumAn is at leisure, to match his greatness, garudAzhwAn assumes the form of the lion-throne for him. dhvaja: – Being the flag, which is visible from distance and pleases ISvara‘s devotees on informing his arrival to them. It also implies that garudAzhwAn is the reason for ISvara’s protection. ya: – His famous and well-known nature is explained as in thiruvAimozhi 9.2.6 “pon malaiyin mImisaik kArmugil pOl” (Like a dark cloud [emperumAn] on a golden mountain [garuda]) and thiruvAimozhi 3.8.1 “puLLUr kodiyAn” (one who rides the garuda and has garuda as the flag). 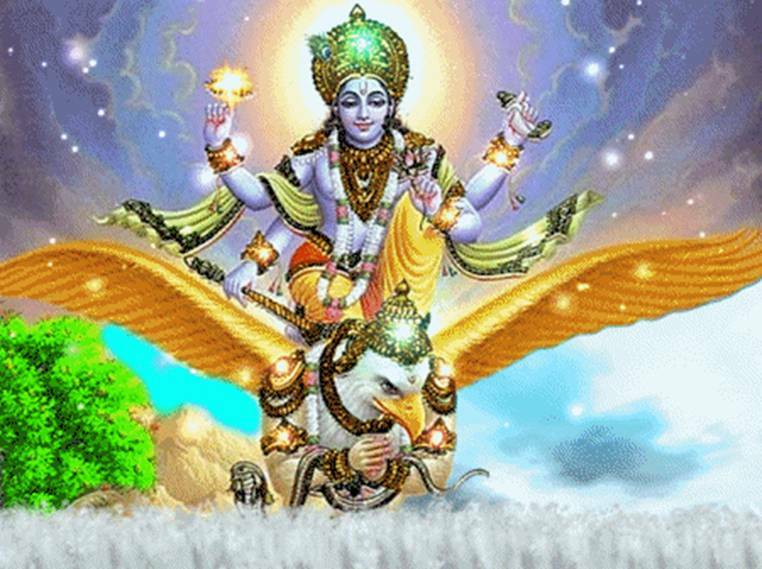 vithAnam – As said in nAchchiyAr thirumozhi 14.3 “vinathai siRuvan siRagennum mElAppin kIzh varuvAn” (one who stays under the wings of the son of vinathA), garuda being the shade-provider. Sage parASara says in SrIvishNu purANam 5.12.4 “garudancha dhadharSOchchairanthardhAnagatham dhvija | kruthachchAyam harEr mUrdhni pakshAbhyAm pakshipungavam ||” (Oh sage! One [garuda] who is giving shade with his wings on top of hari, the leader of birds and one he is invisible is seen by that indhra in the sky). vyajanam – While carrying emperumAn, garuda fans emperumAn with his wings which resemble chAmara. thrayI maya: – As said in thaiththirIya yajussamhithA kANdam 4 1.42 “suparNOsi garuthmAn | thrivruth thE Sira: | gAyathram chakshu: | …” (you are having beautiful wings and named garuthmAn; thrivruth is your head; gAyathram is your eye …), he is having vEdhams as his limbs. “avayavArthE mayat” [Here mayat prathyaya (suffix of maya), is used as “limbs”. maya may be used in different context in different cases]. ISvara is vEdha prathipAdhyan (one who is revealed by vEdham); garudAzhwAn is vEdhaSarIra (one who has vEdham as his body). thEna garuthmathA pura: upasthitham – Like a mirror in front of sarvESvara and like a lemon fruit which has nice fragrance, garudAzhwAn is always in the presence of emperumAn. thvadhanghri sammardha giNAnga SObhinA – When garudAzhwAn carries emperumAn, the scars caused by emperumAn’s divine feet pressing on him, is enjoyable for him – due to that he is shining radiantly. Like SrIkausthubha jewel is an identity for ISvara (his supremacy), for garudAzhwAn, these scars identify his servitude towards ISvara. This entry was posted in Other, sthOthra rathnam on January 27, 2017 by Sarathy Thothathri.